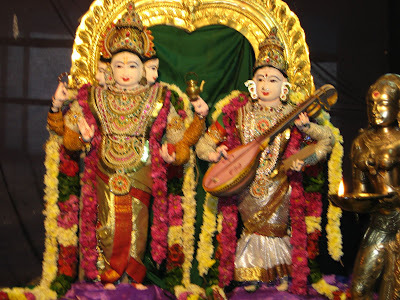 Navami – the ninth day of Navaratri is dedicated to Saraswati, the goddess of learning. At home, we place books and writing implements near the altar of the God, and place an image of Saraswati over it. We do not read or write the whole day, taking the books out and reading them only on the next day, Dusshera, when it is auspicious to begin studies. We pray not only to the goddess of learning, but also to those things which aid us in learning. In the south, students welcome this day, as it gives them a respite from studies, but for us, it has never been so. I remember, we not only had school, but also exams during this period, and had no choice but to study on this day too. My mother used to make me keep textbooks of those subjects whose exams I had already completed, and had to use the other books to study. Not once did I get a break from studies as my cousins in Chennai did. Today, Samhith has no exams, so thank God; we can keep his books for the puja, but just for a couple more years. Then he too will experience the same things that I did. 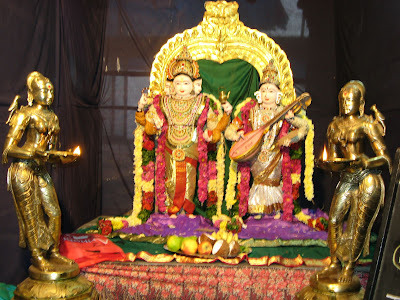 Navami is also the last day for the decoration at the temple, and predictably, it was of BRAHMA and SARASWATI. Meanwhile, where ever I went, I could see preparations for seeing off the Devi underway. 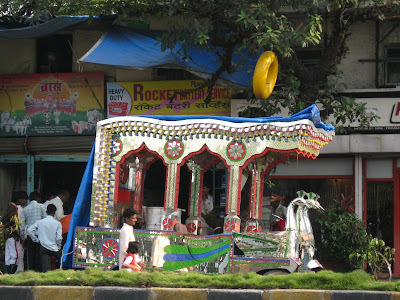 Here is a photo I clicked of a vehicle being decorated to carry the goddess on her journey to her home, via the sea. It looked beautiful even as they were decorating it. It will look fantastic in the night with all the lights on…..